One of the pools at Texas Falls. We have been hanging out in Vermont this past week, enjoying the changing leaves, and visiting some of our favorite places: Texas Falls, Chittenden Reservoir, and Sugar Hill Reservoir. Texas Falls is off of Route 125, a scenic road that ascends Middlebury Gap, and is part of the National Forest. We often snow shoe, ski, or hike on the trails there, as it is one of those places that is beautiful in every season. There are primitive campsites available throughout the area, a dirt road for mountain biking or hiking, and scenic waterfalls and interesting rock formations. We visited on a week day, and found only one occupied campsite despite the glorious fall weather. 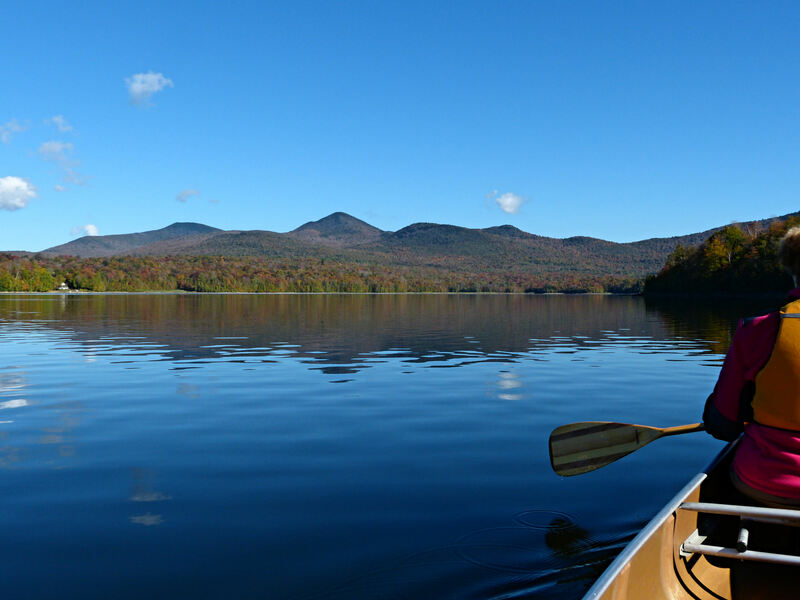 We paddled Chittenden Reservoir again this week and enjoyed an almost flat surface as there was very little wind. The foliage is getting close to peak, and there were few other boaters on the lake. 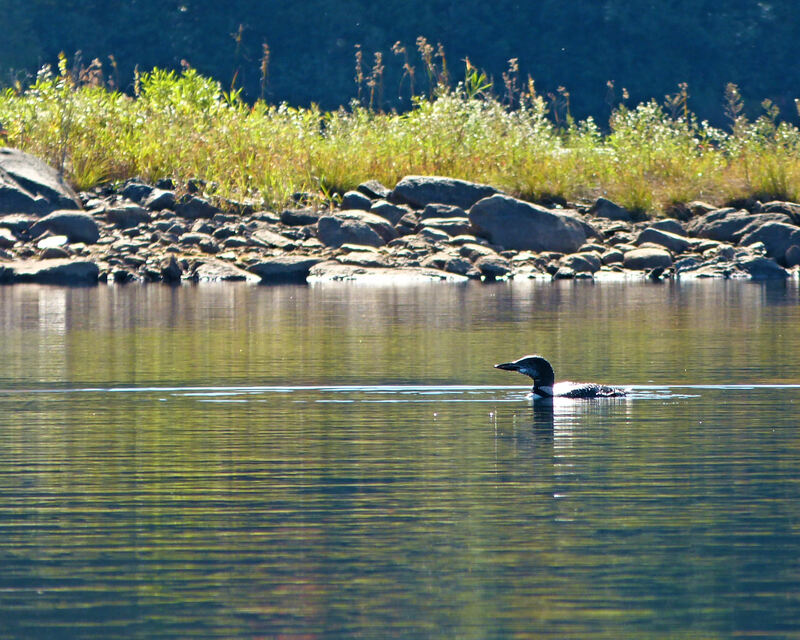 We watched two young loons as they swam and dove. Overall, it was a great paddle and we hope to return again before the leaves are gone. One of our favorite places to see moose is at Sugar Hill Reservoir, aka Goshen Dam, so this morning we left Woolly Bear and took the canoe well before daylight. We were on the water before sun rise, watching the foliage emerge from the darkness and enjoying the bird song and clear night sky. We paddled quietly into the back bay, where we have seen multiple moose on other early morning treks. This morning the moose were not around. That may have been due to a noisy beaver, who swam loops around the back bay and repeatedly slapped the water with his tail, warning all of our presence. We did see a Great Blue Heron, several Kingfishers, and assorted other song birds and ducks. And the brilliant reds and oranges of the foliage made our early morning paddle well worth it! 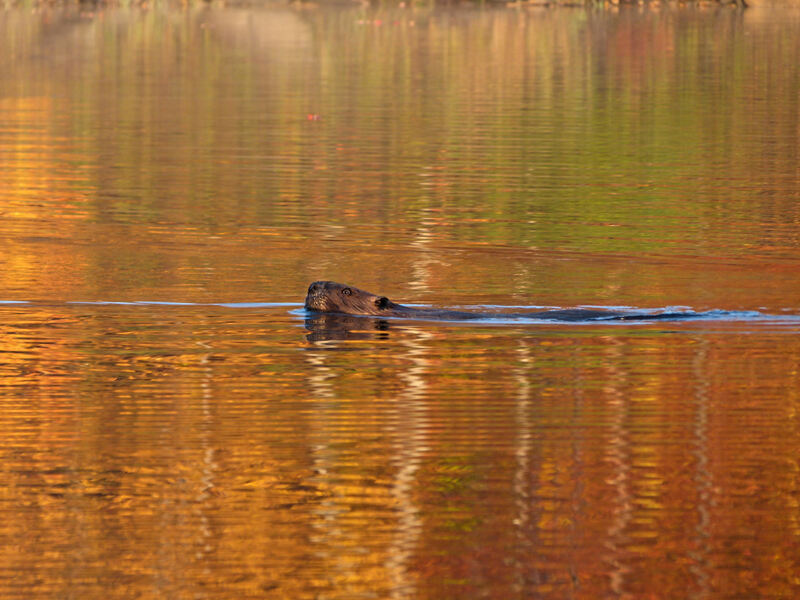 This is the beaver that warned the Sugar Hill animal community that we were on the lake! The week was not all play, though. We spent two days stacking firewood for the wood stove. Now we are officially ready for winter! 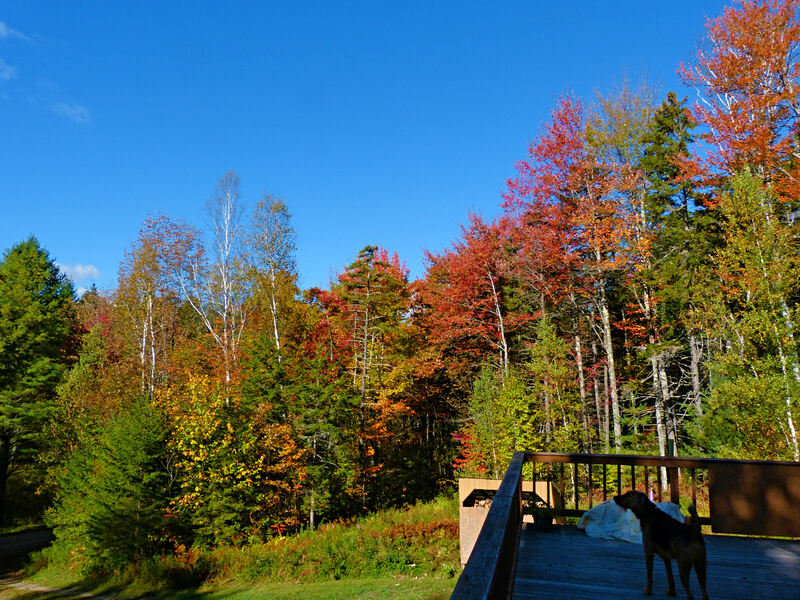 Woolly Bear enjoying the fall colors from the deck. 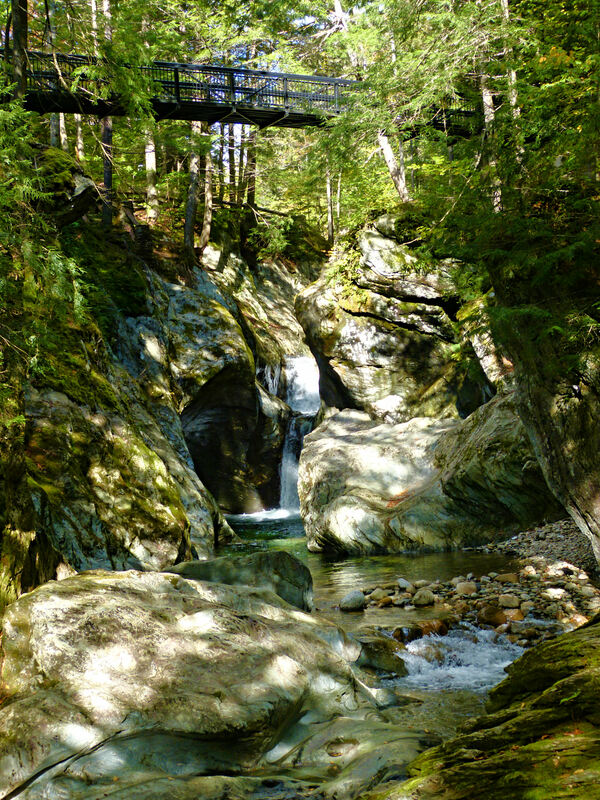 This entry was posted in Vermont on September 30, 2013 by Ramblin' Rose. Terrific post and photos! You, Charlie and WB must be SO enjoying the beauty and serenity of Vermont. I can just imagine how much you are fun you are having with all your outdoor activities. Looking forward to your next post! Thanks, Liz. His ankle is slowly getting better. Today we walked 4 miles in the woods, then I ran my 3 miles in the valley. I’ll connect with you when I am home and see if I can run with you and the ladies! Thanks for reading my posts!!! The colors are great this year! 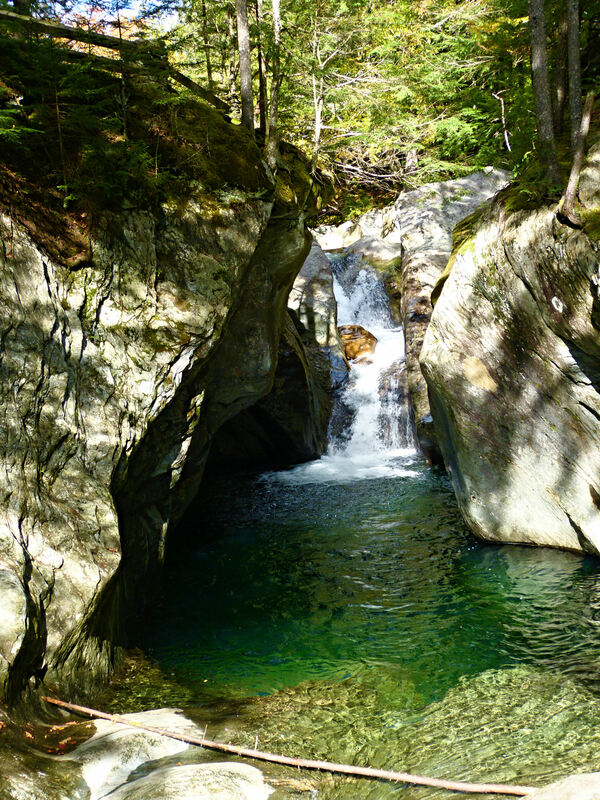 It sounds like you, Charlie and WB are taking advantage of all that the fall season has to offer in Vermont with each day offering exciting new possibilities for exploration…enjoy!